This guide assumes you already have a running Kubernetes cluster and either Gitlab or Jenkins, running within the cluster or externally. If you don’t, and you’re able to use Helm (basically a K8s package manager), there are predefined deployments for both Gitlab and Jenkins in the form of Helm charts which also configures the runner or plugin for you. If you want to experiment with K8s locally, you could use Minikube or the Edge channel of the Docker client (only for Mac at the time of writing). The examples below can also be cloned from my git repo here. , it sends the specified image to the runner. The runner then requests a pod from the K8s API containing the node container alongside a “helper” container which handles git cloning and artifacts. Any script in your pipeline will then be executed in the node container and your sources will automatically be available in a volume in said container. will still cause the runner to do git clones via the external URL, so use the clone-url option to speed up cloning to the runner. to check the logs of the runner. That’s it! Now go run something. If you don’t have a pipeline yet and want to test this setup, create a new project in Gitlab from a template (such as the “NodeJS Express” template) and modify any file to trigger the predefined pipeline. with a desired CI image in a Jenkinsfile, the plugin communicates with the Kubernetes API and requests a pod containing your container alongside a “jnlp-slave” container. This JNLP container acts as a buildslave and handles things such as communication back to Jenkins, git checkouts, and workspace volumes. You’ll find an example further below.
. Then we’ll configure the plugin itself under “Manage Jenkins” > “Configure System”. If Jenkins is running on the cluster the only settings you’ll need are displayed in the image below. 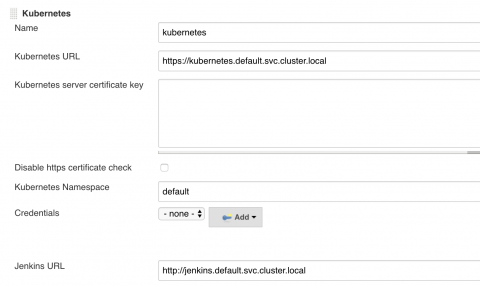 Otherwise, you’ll also need to setup certificate authentication between Jenkins and Kubernetes. block is executed within the JNLP container, which is where git and any Jenkins plugins are available. Anything within the container block is executed in whichever container name you specify. See the plugin readme for more options. It depends. Gitlab has tighter integration with Kubernetes, also offering options besides CI such as automated production deployments and canary releases. Its pipeline syntax is also far more readable and easier than Jenkinsfiles, though the latter allows for more complex scripting. On the other hand, Gitlab’s CI works best if your sourcecode is also versioned there, which may not be an option for many of you, making Jenkins more flexible. So basically, pick whichever CI tool you prefer based on its features, as the act of running CI in K8s pods is pretty similar between the two. What is your .gitlab-ci.yml tho? Are you just pushing to the repo and letting the kubernetes script take over from there? Currently i have my gitlab config doing the build. Should i get rid of this? Your .gitlab-ci.yml won’t change, as long as your project uses the Kubernetes runner (or is the only / default runner). You just need to provide an image: within each stage, or a top-level image for all stages and the runner will create a pod with that container. I’ve been struggling days when following the official kubernetes integration guide to install gitlab-runner, but gitlab-runner failed to start with the message “FATAL: Failed to create listener for metrics server”. Then, your post saved me, and the manual steps are easier than the official guide. Thank you. I’m still have a question: I noticed an external IP allocated for gitlab-runner although there’s no services, how did the pod get the external IP?